I'm on the middle of a two-week trip to England and France. The primary purpose of the trip was to come judge the World Cheese Awards in Birmingham, England. This is the second time that I judge these awards and happily I was chosen again by the Guild of Fine Foods to be one of the fourteen International Supreme Judges. The trip has been fantastic, not only because I got this great honor, but also because this was the first time that Mexican cheese participated in the competition. It was such an experience to see the head global dairy buyers for Whole Foods and Tesco taste Queso de Bola de Ocosingo and give recommendations on how to improve the cheese. The winner of the awards this year was Cornish Blue, a newish (10 yo in the market) cheese that easily took the top prize for England after a ten year wait. Cornish Blue was so delicate, the paste so creamy and the veins of blue perfectly covering all the surface of the cheese. The rind looked rugged but gentle, like a beautiful rock that has been carefully washed away by the ocean. The smell was earthy, sweet and mineral. Truly a gorgeous blue cheese. This year, I championed for the Supreme Judge panel a Camembert with breadcrumbs infused with Calvados. This was a really risky option, because this style of cheese is unique of flavored cheeses and people either hate it or love it. The piece that we tried was a perfect example of raw milk Camembert that was very lightly covered with breadcrumbs and the Calvados making the perfect balance. At the end my cheese divided the Supreme panel in two, with all the British judges hating it and all the rest of the international judges loving it. The South African and Japanese judges loved it so much that it got 5 points from them both. At the end, I was happy to have chosen such a unique cheese and now understand the privilege of being a judge that mainly works in North America where tradition is being enhanced by innovation and an open palate. Another great piece of news from the WCA is that my old friend Sarah Bates from Sheridan's Cheesemongers was chosen this year to be the Irish judge. Sarah is cheese royalty, being the daughter of Jeffa Gill maker of Durrus and the woman recognized as the mother of raw milk artisanal cheesemaking in Ireland. Sarah is the manager of Sheridan's in Galway and the number one person responsible for my career in cheese. You can see the video here. I write from the Eurostar back from Paris to London. I hadn't been in France in eleven years and I found it ever so enchanting, even if a little depressed. Cheese adventures included the obvious trips to local cheese stores and a small tasting of cheeses that don't make it outside of Europe. I will post pictures and names once I get back to NYC and I can upload them from the camera. The most surprising thing about cheese in France, or at least in the places that I visited in Paris, was the flooding of the market of bad commercial cheese. I still can't understand why is this so, this being the most obvious place for good quality cheese. After talking to various people about it, including academics, chefs and expats, the only explanation is that the same depression that people have over a financial turn down, racial and ethnic tensions, and growing discontent with the government over proposed neoliberal reforms has made people also apathetic about food. In bold terms, that quintessential French "joie de vivre" is being diluted. The way that I perceive it is by the selections people make and to me those over what cheese to eat are really important. This is not a unique French situation, my friend Sarah mentioned the same thing going on in Ireland and just before coming on this trip I had the same feeling in New York. The only difference in the US being that there is truly a food revolution in the midst that I did not see in France, but that it's happening in England. On other news, i am not smuggling cheese in my bag - yes, you read it well. I am not bringing any cheese back with me from France to England. Partially because nothing was left of the cheese that I bought for the tasting, but also because there is so much cheese waiting in England. Finally, cheese is about sharing for me, and I normally bring cheese back to share with loved ones, but this time I have a gorgeous travel companion who has been eating and enjoying with me. 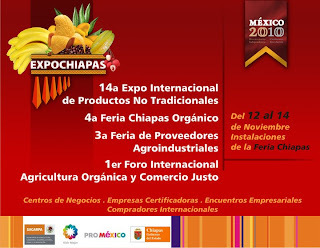 I will be in Chiapas for this event. This will be the fourth time that I will be judging cheeses from Chiapas. The two cheeses from this state that are going to the World Cheese Awards will not be competing this time to allow other producers to have a shot. The other cool thing about this Expo is that there are many small producers of artisanal foods from Chiapas and other states of Mexico. The event is really festive and I will be posting pictures that you can access in the feed. Because the cheesemakers now have a lot of experience doing this type of events, we are also planning a small workshop on marketing and so my sister is coming with me as she has a small catering business and will start commercializing the winning cheeses in Mexico City.